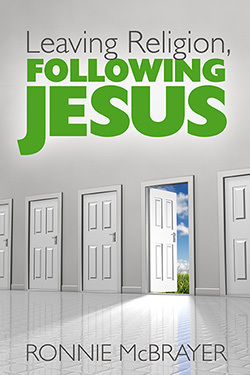 Leaving Religion, Following Jesus is a book about running after Jesus, about a journey with the Christ—his journey and yours. It is a book about looking and listening to the unexpected. It is a book about opening our eyes, unstopping our ears, and soaking up the gracious wonder that he is, the wonder that surrounds us. We do not know where Jesus will lead us; we have no idea of the long journey that waits for any of us. But it begins with that first step; that first halting, timid step that puts you on the road away from religion and onward to the Christ. Ronnie McBrayer holds degrees in Christian education and theology. He has been a pastor, chaplain, leader in social justice ministries, and a writer. But the role he enjoys most is being husband to Cindy and father to Blayze, Bryce, and Braden. Ronnie is the author of But God Meant It for Good and Keeping the Faith. He also writes a popular faith-based weekly column for the newspapers of the Freedom Communications group. Chapter 5: Whose Side Is God On? Chapter 6: Who Could Blame Him?